Last night was the penultimate City of Langley council meeting for the year. As normal, I will be putting up multiple posts about the meeting. Today, I want to focus on a townhouse project that was ultimately approved by council. 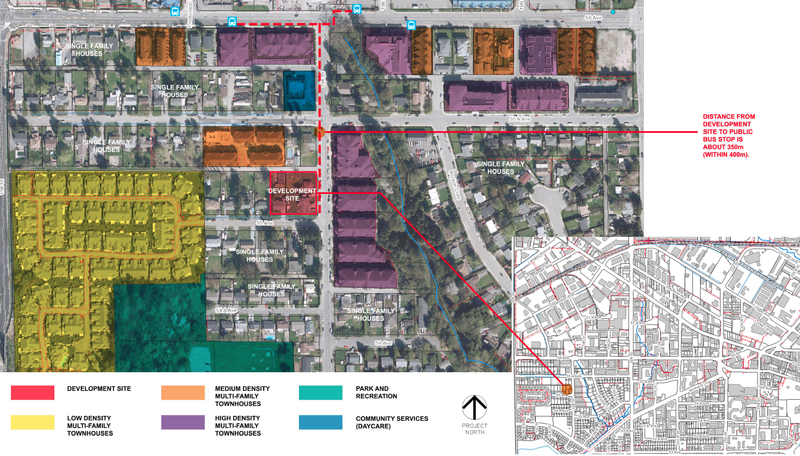 The Nicomekl Neighbourhood in the City is transitioning from an area of single-family housing to an area with apartments and townhouses. When a neighbourhood is being redeveloped, there can be growing pains. Map of area as provide by proponent of the townhouse project. Includes current zoning. Select image to enlarge. As I observed last night, people were supportive of the design of the townhouse project. People’s concerns were focused around the potential externalities of the new project. Rendering of townhouse project. View form 199th Street. Select image to enlarge. Some residents along 198th Street -between 53rd Avenue and 56th Avenue- expressed concern about the number of people driving along 198th Street, the speed of the vehicles on that street, and on-street parking in the area. These are legitimate concerns that should be addressed. The proponent of this project held a neighbourhood open house to let people give feedback, and learn about the project. Based on that feedback, the proponent made some design changes to the townhouse project. In some apartment buildings, large pickup trucks cannot fit into underground parking. Some of these vehicles get parked on-street as a result. The proponent of this project ensured that these larger vehicles would be able to use the provided on-site parking. Many on council, including myself, noted that we may need to review height requirements for underground parking. To make the intersections around the project safer for all modes for travel, the proponent is adding curb bulges which is a best practice for urban streets. This will also help manage on-street parking. I hope this design can be rolled out to all intersections along 198th Street. The proponent had a traffic engineering firm do a vehicle traffic count between November 21st and 28th. They also observed the demand for on-street parking in the area twice; once was at 4:30pm, and another was at 8:00pm last month. They found that there was always an on-street parking spot available at least every 100 meters (one block). Parking along 198th Street is currently not managed. If there wasn’t an available parking spot every block or so, managed parking could be considered in the area. This is not the case yet. The traffic engineering firm also found that people traveled the speed-limit for the most part along the 198th Street corridor, but didn’t slow down to 30km/h for the playground zone around Brydon Park. While not related to this project, it looks like the City may need to put in traffic calming around that playground area. 198th Street was designed to handle about 10,000 motor vehicles per day. Based on last month’s traffic count, there is an average of 4,000 vehicles per day. During peak travel periods, there is 350 vehicles per hour which is well under the 700 vehicles per hour limit where congestion would occur. That road could handle double the traffic that is on it today. Based on the information presented at last night’s meeting, I am satisfied that the 198th Street corridor can accommodate future higher-density housing with the caveat that we work towards making safer intersections, keep an eye on on-street parking demand, and put in traffic calming where required.